Virtual reality is not even six months old on Facebook, but brands are already finding creative ways to film and post 360-degree clips. On Thursday, Liberty Mutual launches its first VR campaign, and it picked Facebook as the go-to platform. 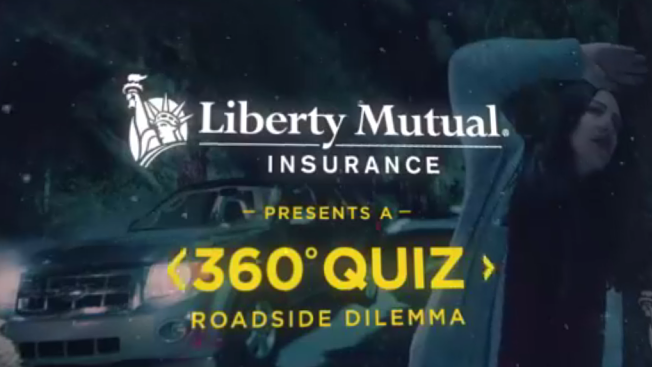 Working with Havas and Facebook's Creative Shop, the brand's spot promotes Liberty Mutual's 24/7 roadside assistance and is set up in the style of a quiz. "Insurance isn't the most high-engagement story, so it's an opportunity for us to use 360 video to help us tell our brand story," said Emily Fink, Liberty Mutual's vp of digital and social. "It's like a choose-your-own adventure." The video is divided into four parts and starts out by asking, "If your car breaks down in the middle of the woods, what should you do?" Viewers then answer the question by tilting their phone around to scroll through three scenes. Each scene correlates to a different answer—"set up camp," "wander through the woods" or "call roadside assistance." Take a look at the clip here (which is best viewed on a smartphone). While plenty of brands—Jim Beam and AT&T to name a couple—have created 360-degree videos that replicate the feeling of spinning around to see a new perspective, Liberty Mutual filmed the spot differently to create four separate scenes. Typically, VR footage is shot with a rig to capture all angles, helping to automatically pre-stitch it for post-production. Instead, Liberty Mutual filmed its video with an Alexa HD camera tilted on its side, filming each scene four times. The process requires more pre-production planning and manually stitching it together in post-production, which Fink said gives it a higher quality. "It's almost like an Easter egg hunt where you're incentivizing people with different aspects of the story to continue to move your phone around," she said. "Every time you move the phone, you're going to see a different part of the story."